Yet, when it comes to God's will, we live in fear that He is holding out on us some how. But the Bible clearly reveals God's will for your life. You only need to listen. • "What if I discover I've been doing something other than His will?" • "If I somehow stepped out of God's will at some point, can I ever get back on track, or is my case hopeless?" And if you want to stay that way, don't read this book! 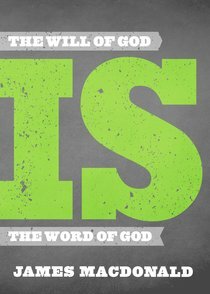 About "The Will of God is the Word of God"
James MacDonald is founding and senior pastor of Harvest Bible Chapel in Northwest Chicago, Illinois. He holds degrees from London Baptist Bible College (B.A. ), Trinity Evangelical Divinity School (M.A. ), and Phoenix Seminary (Doctor of Ministry). He has written many books inlcuding Lord, Change My Attitude...Before It's Too Late and Gripped by the Greatness of God. Pastor MacDonald's teaching can be heard on radio all across North America. He and his wife, Kathy, have three children and reside in the northwest suburbs of Chicago.